America’s favorite wireless carrier, T-Mobile USA, which recently updated its network to HSPA+ technology, enabling customers with speeds of a 4G network. T-Mobile has tagged its network as “America’s Largest 4G Network” compared to other 3G networks as well as other networks offering 4G solutions. Celebrating the availability of these enhanced services, the wireless carrier decided to pump up the fun and placed a contest for mobile phone users in the country, and that too socially. The official T-Mobile Facebook account was flashing to display the prize. No Purchase or Payment is necessary to enter or win the contest. Purchase would not increase your chances of winning a prize in any way and is open only to legal residents of the United States. Those people who are interested in the matter would only need to “LIKE” the wireless carrier’s Facebook Page. Sharing videos, streaming music, downloading movies—just a few of the things your phone can do on America’s largest 4G network. 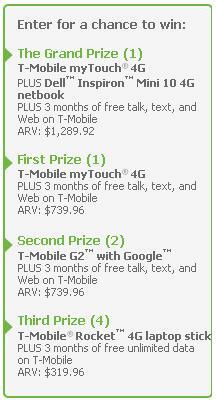 And now’s your chance to win your own 4G device and take advantage of T-Mobile’s new lightning-fast speeds. Simply Like our page, then fill out the entry form, and you’ll be entered for a chance to win one of our new 4G devices, plus three months of free service. Be sure to check back often before the sweepstakes ends on December 10th. You can enter once each day, and every entry increases your chances of winning a prize. America’s largest 4G network—a gift to you from your friends at T-Mobile.